A recent NC State University graduate student, Arun Babu, has worked to generate new thresholds for stink bugs in corn. 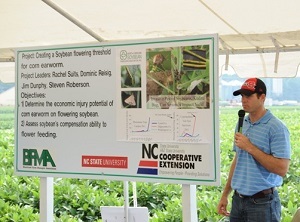 His work was supported by the growers of North Carolina through the NC Agricultural Foundation and the Corn Growers Association of North Carolina. Arun visited corn fields across eastern NC and tested how to more efficiently scout for stink bugs. He then applied our existing thresholds to his findings. Based on his findings, scouting should be more accurate and time-efficient. The thresholds in the table below change across the growing season and are specific to certain plant parts for partial plant sampling.